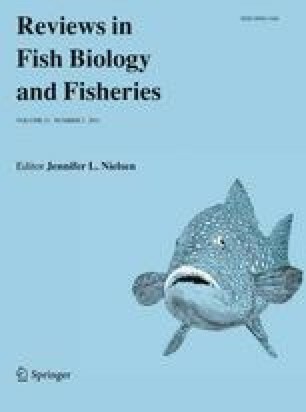 The taxonomic status of hake (Merluccius spp.) in the northeastern Pacific is unclear. Hakes in this region are Merluccius productus, M. angustimanus, M. hernandezi, and a morphotype known as dwarf hake. Of these, only the first two species are currently valid. Descriptions in previous studies have been limited by overlapping morphological characteristic, lack of biological material, and limited numbers of sampling localities. To clarify their taxonomy, 461 hake were obtained from eight localities along the North American coast for morphological and mitochondrial DNA sequence analyses (cytochrome b, cytochrome c oxidase subunit I, and 16S ribosomal rDNA). Morphological and molecular analyses suggest that hake in this region represent a continuum of a single species with some levels of morphological and genetic intra-specific variation. In light of these results, we propose that M. productus is the only species of hake present along the North American and northern Central American coast. Hake samples were provided by Manuel Nevares, Mike Canino, Maria de L. Gonzalez-Rugge, Hugo Cirilo, and Eva F. Isaak Vissuet. Special thanks to the crews of the INP and CIBNOR vessels for cruises to obtain samples; the Pacific Choice Seafood of California, and the commercial shrimp fleets of the Pacific coast of Costa Rica. We thank Lucía Campos-Dávila at the Colección Ictiológica at CIBNOR. This project was funded by the Secretaría de Agricultura, Ganadería, Desarrollo Rural, Pesca y Alimentación de México and the Consejo Nacional de Ciencia y Tecnología (SAGARPA-CONACYT grant 2005-12058 to FJGDL. CASS and MBC received CONACYT fellowships. Additional advice was received from Gil Rosenthal, Darrin Hulsey, Ingo Schlupp, and Miguel Cordoba.